There are days when everything seems to be going right on the job - and days where it all seems to go wrong. If today is one of those days and you’re ready to throw in the towel, be encouraged. 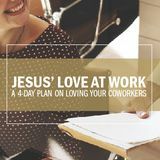 Jesus walks through work with you - even when it gets you down. Why Is It So Hard to Connect Spiritual Value to Our Work? Sometimes it seems like God is everywhere, except at work. A Childhood Wish for Walkie-Talkies. Over. Each day we imagine what things could be like, and we are often discouraged when they do not match our dreams. Jesus claims that the situations we might feel aggrieved or sad about can be the very ones to make us blessed or happy. My hope for Jim's fruitful future at our church shriveled on the vine. I felt like a dismal failure as a boss. Are You Pinned Down By Circumstances? Published by The High Calling, November 7, 2018. Image by Fancycrave.com. Used with Permission. © 2018 by The High Calling and the Theology of Work Project, Inc.